A guide for British businesses interested in selling goods and services in Austria. Visit great.gov.uk for guidance on how to research overseas markets as well as a range of other important issues for exporters. Source: World Bank: Ease of doing business 2016. Austria is one of Europe’s wealthiest nations, with a high income per head and relatively low living costs. The most common language spoken is German. Austria is considered an easy market for UK companies to do business in. If your product or service is successful in the UK, there’s a good chance you could be successful in Austria. However, you must either have a product new to the market, or be able identify reasons why an Austrian company should switch suppliers if they’re in a relationship with a company supplying a similar product. The majority of Austrian companies are in long-lasting supplier relationships so your product or service must have unique selling points (USPs) or advantages if they are to have a strong chance of finding market share. Although Austria is a small country, there are over 48 million people living within a 250 mile radius of Vienna. The country is therefore an ideal starting point for access into central and eastern European (CEE) markets. Read the EU’s practical guide to doing business in Europe, which gives detail on rules and processes common to European countries. Market research and planning are essential before starting to sell your products and services in Austria. It will help prevent costly mistakes and maximise the potential for profits. Austria has similar regulatory framework for business to the UK. Visit the Department for International Trade’s (DIT) events portal to find upcoming events. DIT provides free international export sales leads from its worldwide network. Find export opportunities in Austria. Set up a trade profile on DIT’s Find a buyer service to connect with international buyers. Find high-value public procurement notices from the EU and European Economic Area (EEA) on Tenders Electronic Daily (TED). Public authorities in Austria select suppliers by public tender. These tenders are published in several newspapers and websites. The daily newspaper Wiener Zeitung (site in German) publishes more tenders than other sources and in greater detail. You must register with these organisations as they purchase equipment and services via public tender for their operations worldwide from their offices in Vienna. Once you’ve done some initial research you should create an export plan and identify your best route to market. Consult local English-speaking lawyers when you enter a new market to avoid costly mistakes and ensure you start out in the way that is best suited to your sector of activity. Selling directly to customers means you handle all the processes involved in marketing, selling, sending overseas and getting paid. Direct selling is possible in Austria, especially through online sales, but it may not always be the most effective route into the market. With German being the preferred business language in Austria you may wish to source a local agent, distributor or wholesaler to act on your behalf. A distributor based in Germany or Austria may work for the small Austrian market. However, if you’re looking to expand into eastern and central Europe, an Austrian distributor may be better. Large chain stores, mail-order houses and department stores are all crucial importers. Some industries and smaller manufacturers also work as both importers and suppliers. In certain sectors selling to wholesale importers is a common method of distributing goods in Austria. As this is a relatively small market, smaller quantities are required so these are often channelled through wholesale importers, usually based in Germany. DIT’s trade specialists can help you identify local representatives for your products in Austria. You can set up branch offices, corporate entities and business partnerships in Austria. Find out about setting up a business in Austria. Once you have set up an office or company in Austria you must get a trade licence and become a member of Wirtschaftskammer Österreich (WKÖ) (site in German) which is Austria’s federal economic chamber. A digital presence can help you gain new customers 24 hours a day, often at low cost. Find out more about reaching new customers online. Read guidance on online and distance selling. Use the DIT’s selling online overseas tool to get exclusive deals for your business, negotiated by the UK government. Find out how the DIT’s E-Exporting programme can help you export your products overseas. If you have a suitable product or service you can license them to be sold in Austria. It’s is a cheap way to enter the market as there are no set-up costs apart from the cost of a legal agreement. You should undertake due diligence on licensees to ensure your intellectual property (IP) rights are protected. Find out more about licensing IP. Visit the international section of the British Franchise Association for information on franchising. To make it easier to fulfil an export contract and grow your business, schemes are available to UK companies selling products and services to Austria. Contact your bank or specialist financial organisation for assistance. UK Export Finance (UKEF) has significant risk capacity to support exports to Austria. Contact one of UKEF’s export finance managers for a free and impartial consultation. They can help check that you are getting the appropriate financial support and, if not, explore how to bridge any gaps. You may wish to talk to a specialist about finance, including how to get paid in Austria. This could be a bank, accountant or you can contact the DIT team in Austria who will help you find a financial adviser in Austria. Your contract should specify the terms for payment. Within the EU, many businesses use open account payment terms (delivery of goods or services before payment) in much the same way as within the UK. Customers in Austria may require credit terms to buy your products and services. Payment conditions must be factored into prices. For business-to-business transactions these can range from immediate payments on receipt of goods (often with a negotiated small discount) to a negotiated 60-day payment. Standard payment terms for business-to-business transactions in the EU are 60 calendar days and 30 calendar days for public authorities. Late payment interest can be claimed when terms are not met. Find out more about the EU’s late payment directive. UKEF helps UK companies get paid, by insuring against buyer default. Speak to one of UKEF’s export finance managers for a free and impartial consultation on your insurance options or contact one of UKEF’s approved export insurance brokers. If you have not fixed your exchange rate, you have not fixed your price. You should consider whether the best option for you is to agree terms in sterling or euros in any contract. You should also consider getting expert financial advice on exchange rates (sometimes called FX). Capital can be moved in and out of Austria within the EU without any legal restrictions. You only need to complete certain minor bank formalities for statistical information. You can transfer capital, dividends, and proceeds of sale abroad without any limitations or taxes if you hold registered foreign investments. EU legislation forms the basis of the law for trade and commerce in Austria. A trade licence (‘Gewerbeberechtigung’) is needed to carry out any trade or business activity in Austria. You must apply to the relevant district (‘Bezirkshauptmannschaft’) or municipal authority (‘Magistrat’) for a licence. You must also register with the local tax office. Contact the DIT team in Austria to help find tax and legal advisers before entering into agreements in Austria. It is essential to ensure you have the correct certificates for doing business in Austria. The ‘Gewerberecht’ (trade regulation act) governs self-employed people working in the private sector. There are also specific regulations for certain areas of the private sector, like banks and insurance companies. If you set up an office or company in Austria and need to employ local staff you must comply with local employment law. Certificates of qualification are essential for many professions to be able to operate within certain sectors, including telecommunications, engineering and construction. These are known as ‘regulated professions’. It’s often easier to make sure the head of the local business is an Austrian national with the appropriate qualifications. It can be a lengthy process for other nationals to get the correct qualifications. Find a listing of professions which are regulated in Austria. You must have a licence to supply any goods, software, technical information and technology to Austria which are on the UK Strategic Export Control Lists. There are a number of open licences available for exporting many military and dual use controlled items to Austria and it’s a straightforward registration process. If you can’t use an open licence you will have to apply for a standard licence. Check if you need an export licence and apply on SPIRE. Some other products, including consumer items, may need additional certification or licensing. Find out which products need certification or licensing before they can be exported to Austria. If you’re selling to consumers (rather than businesses) you must comply with EU consumer protection law. Customers in Austria have various consumer rights when you sell at a distance (not meeting the customer face-to-face). Find out about consumer rights in the EU. If you provide a service and want to protect yourself against negligence claims from clients or third parties, you may wish to consider taking out professional indemnity insurance. In some sectors such as healthcare and construction, there are regulatory differences between Austria’s 9 provinces. Find out about standards in the EU. Find out more about packaging regulations in the EU. Find out about requirements for using wood packaging in the EU. Product standards are the same in most EU member states. If you sell products in the UK it’s likely that you already comply with standards for the rest of the EU. Many products require a CE marking before they can be sold in the European Economic Area (EEA). This marking proves your product has been assessed and meets EU requirements for safety, health and environmental protection. Find out how to obtain a CE marking. If your product isn’t listed in the EU’s ‘CE marking’ requirements you must check local standards in Austria at Oesterreichisches Normungsinstitut (site in German). You should consider taking out product liability insurance if you manufacture or supply a product. Labels must show measurements in the metric system and a mark of origin (‘Made in’) label is essential. You can choose to use the ℮ mark on packaging when exporting food products to Austria, or use Austria’s rules on weights and measures. Read the UK Intellectual Property Office’s (IPO) guidance on exporting your IP. Read an overview of protecting your IP in EU markets. If you do business in more than one EU country, an EU trademark and a registered community design gives protection in all 28 member states. If you only want patent protection in Austria you can apply direct to the Austrian Patent Office (site in German). You can use the European Patent Convention (EPC) to protect your patent in the member states of the European Patent Office (EPO). Apply for an European patent through the IPO or direct to the EPO. Your patent application will be processed as a single application. Once granted it turns into separate patents in the countries you designate. However, if your patent was registered in English you must supply a translation in German to the Austrian Patent Office and pay the required fees within 3 months of issue. The UK and Austria have signed a double taxation agreement. This agreement should, in most cases, prevent any double tax liability from UK and Austrian authorities over the same income. If you, or your UK company, earn money from your exports that’s been taxed in Austria it shouldn’t be taxed again in the UK. UK companies operating in Austria will be subject to local taxation requirements. Read more about tax in Austria. The general rate is 20% for most manufactured goods and services. A lower rate of 10% is levied on food, agricultural products, property rents, and some other items. Goods exported from the UK to Austria are zero-rated for VAT purposes if your Austrian customer provides their VAT registration number and you have proof of export. You’ll need your Austrian customer’s VAT registration number for your VAT Return and paperwork proving that the goods have been sent within certain time limits (usually 3 months). Check to see if an Austrian VAT number is valid. Find more information on VAT in EU markets. Find out about VAT requirements if you’re supplying digital services to EU markets. Find out more about complying with Intrastat rules. If your customer is not VAT-registered you must charge VAT at UK rates and include the amounts on your VAT Returns. You must pay excise duty on any alcohol, alcoholic drinks, energy products, electricity or tobacco products you send to Austria. Find out more about excise duty and duty drawback within the EU. Find out more about the rules on payment of excise duties in EU markets. Corporate income tax is levied at 25% in Austria. Austria is part of the EU single market. This allows the free movement of goods and services without customs checks or the need to pay duty (except excise). You can send most goods to Austria without special customs documentation. Excise will need extra documentation. Other goods may require export licences. Read HMRC’s guidance on dispatching your goods within the EU. You’ll need a licence to temporarily take any goods on the UK export controls lists to Austria. Check if you can use an Open Licence for your temporary export. If not, use the SPIRE system to apply for a temporary export licence. If the items aren’t being returned to the UK, you’ll need a permanent export licence. You can usually send samples of your goods through the postal system. Your local post office can also be used to export small orders to Austria if they can be easily packaged and are within the current weight restrictions. For bigger orders, most businesses use a courier or freight forwarder. If you’re sending goods by post you must check that the items are not prohibited or restricted by mail services in the UK and in Austria. Find out more about prohibited or restricted items in Austria on Royal Mail’s website. When using postal services commercially you must complete the required customs form with the commodity code that relates to your goods. Find your commodity code in the UK Trade Tariff. Email HMRC’s Tariff Classification Service for more help on tariffs. Find out more about VAT and customs requirements to export your goods to Austria using postal or courier services. If you’re exporting goods in any volume to Austria, it’s likely you’ll want to save time and money by using a freight forwarder or courier. Find out about shipping your goods to international markets using a freight forwarder. Special rules apply if you’re shipping dangerous goods to Austria. You must have a clear written contract to minimise the risk of misunderstanding in international commercial transactions. Find out more about agreements on terms of delivery using Incoterms. The International Chamber of Commerce (ICC) publishes the Incoterms Rules. Incoterms do not cover contracts for delivery of services. Contracts for international delivery of services should focus on desired outcomes such as, what the service should achieve. This should be part of a service level agreement in your contract. Austria is a member of the EU and the World Trade Organization (WTO). Contact the SOLVIT team if you have problems accessing the single market. Business formality is the norm in Austria. Family names are most often used; first names are reserved for close friends. Professional titles should always be used, for example, Herr Doktor. Punctuality is highly regarded. UK citizens don’t require a visa to enter Austria, but must travel with a valid passport. If you’re travelling to Austria for business, check the Foreign and Commonwealth Office (FCO) travel advice first. 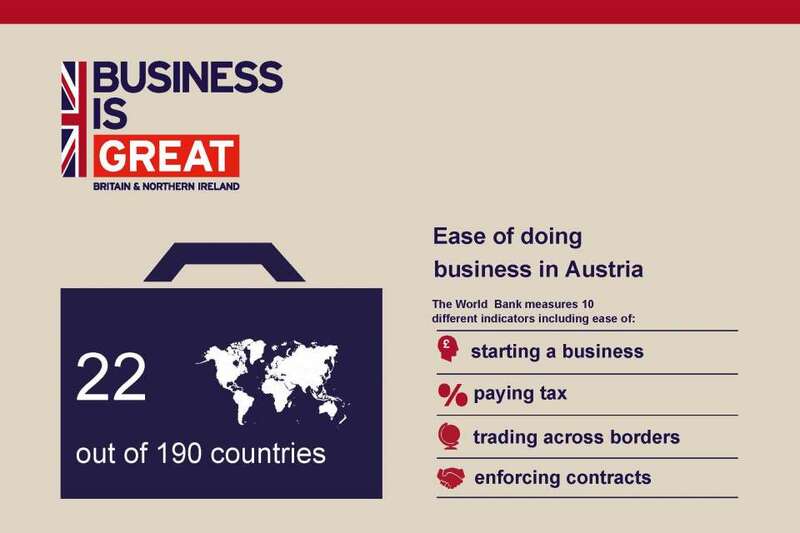 Contact a local DIT trade adviser in the UK if you’re interested in finding out more about doing business in Austria. Contact the DIT team in Austria for more tailored information and advice on opportunities for doing business in Austria.